In the late ‘80s we built the Country Inn and Hotel - or Hostería, how we call it in Ecuador - on the remnants and foundations of an old and dilapidated farmhouse or hacienda from the 18 century. We endeavored to preserve the essence of the colonial hacienda style with local materials, crafts and techniques and called it "Cuello de Luna", which means Cotopaxi. this name was given to our volcano by the local indigenous people long before the Quechua-speaking Incas conquered in the 16 th century what's today known as Ecuador. In English, "Cuello de Luna" means "neck of the moon". If you visit us at full moon, you will probably see why. Now Cuello de Luna is our home, a little gem and lush green paradise in the high Andes, surrounded by volcanoes and mountainous landscapes. We invite you to share and enjoy with us the peace and nature and explore our area. 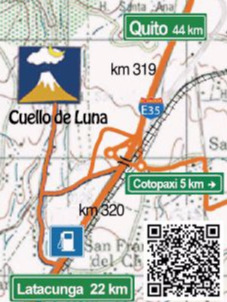 Located at the foothills of Cotopaxi Volcano and the Iliniza Mountains at 10,250ft (3125m) on the trail head of the Quilotoa Loop, Cuello de Luna is a great place to stay, even more, if you plan to visit the Cotopaxi National Park, the indigenous market of Saquisili and Zumbahua and the Quilotoa crater with its turquois lake. It is a great area and environment for hiking, mountain biking, horse back riding and the preferred starting point for excursions to Cotopaxi National Park, for climbing Cotopaxi, Iliniza and Chimborazo, and for day hiking, trekking, acclimatization and relax while enjoying the comforts of home in spectacular mountain scenery. Enjoy our day hikes and tours in the Cotopaxi National Park and acclimating hikes to the summits of Iliniza, Rumiñahui, Santa Cruz and many more. If you are a climber with serious ambitions they will help you to acclimate for your ascents and be prepared for your climbs to Cotopaxi, Ilinizas, Cayambe, Antisana and Chimborazo - the highest mountain of Ecuador.